Is the morning of the first day of school a frenetic, crazy time at your house? How about the next few days? Whether your child is elementary- or high-school bound, it’s hard to get her up and moving in the morning and to bed at a reasonable time. Once she’s awake, then comes figuring out what to wear, a frantic search for the missing shoe because another pair isn’t acceptable, followed by general chaos that causes wasted time, drama and stress! It doesn’t have to be this way. With some simple planning and organization, things can run smoothly. 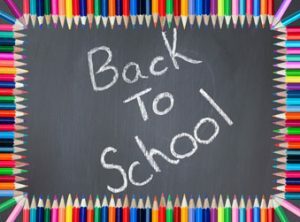 Whether your child is starting school for the first time or a returning student, these tips will ease the transition from summer to school. Create a schedule to complete any unfinished summer assignments. Review your child’s clothes and shoes, fill in as needed and donate what no longer fits. Do the same for school supplies. Schedule medical and dental appointments. Start your child’s school routine one to two weeks ahead. Establish regular meal times and school bedtime. Set the alarm to wake up, dressed and fed on time. Start limiting TV watching and time on devices. Except for the very young ones, have your child lay out clothes the night before. Make lunch the evening before. Create a laminated ID card with your child’s name, address and phone number, parents’ names and contact info, and important medical and other information, and secure it in the backpack. Have a system for papers coming from and going to school. It can be as simple as two labeled folders: To Home and To School. Set up a dedicated spot for homework, ideally a desk with supplies within reach. For the first few days before school starts, add a half-hour to whatever time you think you’ll need for the morning routine. It’ll make the back-to-school transition much easier, especially for you! next post: Is a Capsule Wardrobe Right for You?